Upon watching the trailers for ‘Last Vegas‘, a comedy starring several older actors, all over the age of sixty in a movie, very similar to ‘The Hangover‘, made me have my serious doubts on how good this could actually be. On one hand, I saw this film playing out for a crowd over 50 with cute humor that my mother and grandmother can laugh at, but not much else. And on the other hand, this could have just failed on every level, with poor dialogue, bad characters, and no real story plot, but rather just a muse to get some amazing veteran actors together to make a quick buck. Well, I couldn’t be more wrong. This comedy starring Michael Douglas, Robert De Niro, Morgan Freeman, Kevin Kline, and Mary Steenburgen is smart, witty, heartfelt, and hilariously funny. So much so, that I expect great returns at the box office to see these five actors cut a rug and have a ball for two hours on screen. 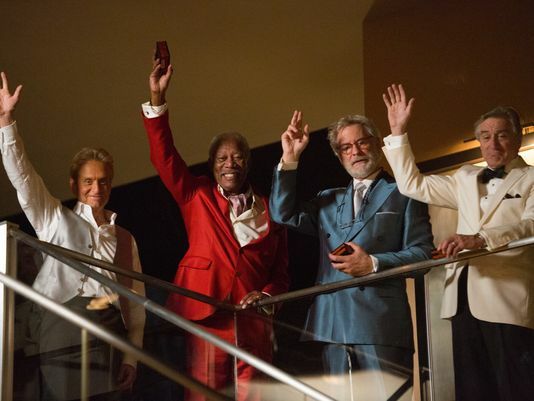 CLICK HERE TO READ MY FULL REVIEW OF ‘LAST VEGAS’!!! But works so well with this film is the guy’s chemistry with one another. Their characters have deep layers and prove that still after 60+ years, they still have much love for one another and will still be loyal and protect one another. There are some true heartwarming scenes as well as some gut busting laugh out loud scenes often. We are used to seeing Morgan Freeman playing the straight and narrow character who more or less is God-like. But here, he completely lets loose, and I must say, we need more of this from Freeman. Once you see Freeman play drunk and dance, you’ll never want to stop watching him. It was truly amazing. Kline doesn’t have the meatiest role her, but his comedic timing and dialogue is perfect. Douglas and De Niro might seem at first to be playing roles they’ve always played, but as time runs, we see that there is much more to them than meets the eye. And Steenburgen is so beautiful and has an amazing voice in this film. She truly steals the show with all of her wit, charm, and beauty. ‘Last Vegas‘ was much better than expected and packs enough heart and laughs made for two films. I cannot wait to see this again, or at least a sequel. Highly recommended. This entry was posted on Friday, November 1st, 2013 at 12:22 am	and is filed under Film, News. You can follow any responses to this entry through the RSS 2.0 feed. You can skip to the end and leave a response. Pinging is currently not allowed. « Film Review: ‘Ender’s Game’! !